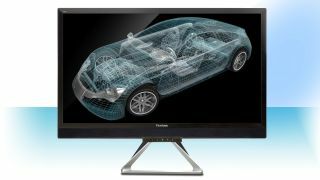 First unveiled at CES earlier this year, the Viewsonic VX2880ML is now bound to the UK with a recommended retail price of £431 ($831, about AU$790), undercutting both Samsung's and AOC's monitors. As for the two models, Viewsonic's one displays 3,840 x 2160 pixels on a 28-inch diagonal. Connectivity includes DisplayPort (DP - input and output for daisy-chaining), Mini DP, MHL 2.0 and HDMI 1.4. The panel sits on top of a stand that supports a lightweight 4.4Kg but that excludes an unwieldy 90W external power adaptor. Other features include a pair of 2W speakers, 30-bit colour, a contrast ratio of 1000:1, a response time of 5ms, a brightness of 300cd/m^2, a VESA mount and a power consumption of only 44W. The VX2880ML will target 4K content developers, graphic designers and gamers although prospective customers will need to make sure that their computers can handle 4K displays both in terms of output and performance. The number of vendors shipping 4K monitors is growing steadily. Samsung, AOC, Philips, Asus, Lenovo, Acer, Dell and Illyama currently have one or more models with a couple of larger 4K TV from Samsung (40-inch) and Argos (39-inch).